Spike, left, and Dr. Stan share memories. Did you know the club used to meet at the old Riverwood Golf Course in Dundee? And at Jay’s Restaurant? And at the old Bowman’s Restaurant? “The food sure has been varied,” laughed Stan. One of the biggest changes Stan’s noted is that membership used to be available to men only, and everyone wore a tie to meetings. Note: There were only three men wearing ties last week. One story I enjoyed was about the origins of the Duck. Spike said it started as a plastic pumpkin that was used to collect fines. Since it was orange, it got connected to the Beavers. 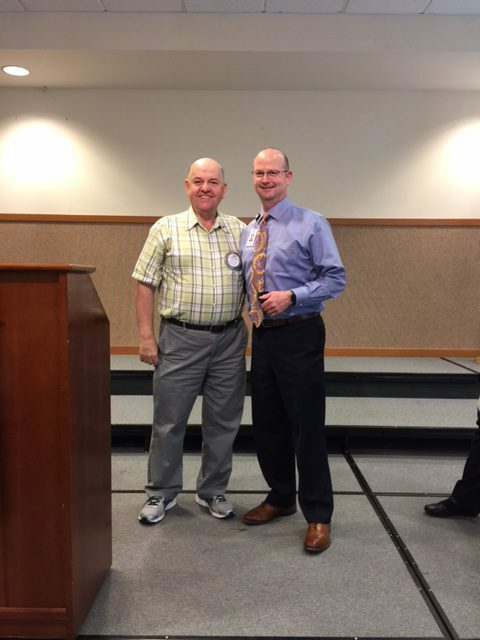 Everyone knows Spike’s a passionate Oregon Ducks fan, so he took a duck decoy from his collection, cut a hole in it, and the rest, as they say, is history…..
Dr. Stan figures he is now the oldest serving member of the club, with a whopping 53 years in Rotary. 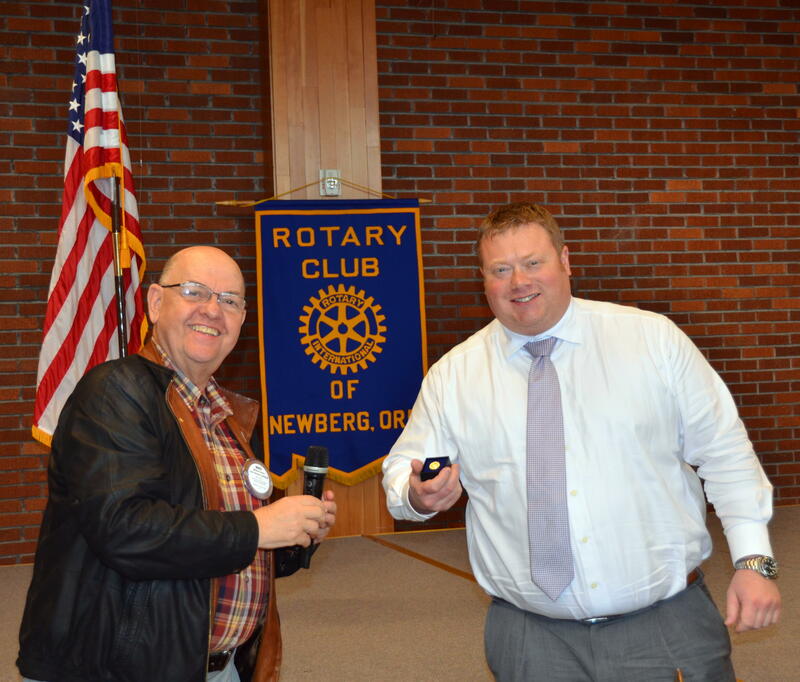 He gave us some background on how he became a physician in Newberg, and how that led to his Rotary membership. He developed a desire to be a doctor early in life. He was one of six kids, and had a sister who passed away from whooping cough. ” I felt reassured when the doctor was there. Of course, that was when doctors still made house calls,” he said. Two things helped enforce the idea he should be a physician and in Newberg: One was that the doctor in town was driving a new Chrysler, while Stan’s dad was driving a Chevrolet! 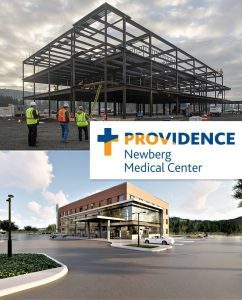 The other was that a physician in Newberg was looking for someone to take over his practice for three years, and Stan decided to take a chance. He was then invited by another physician to attend Rotary. The speaker at that meeting was Mark Hatfield. “I was impressed by the caliber of people,” he said. “Rotary to me is involvement, ” he said, “with things like the scholarships, meals on wheels.” He was president of the club in 1975-76. Mike Caruso handed out three Paul Harris awards last week. Congratulations and thanks to: Grant Austin, LeRoy Benham and Jeff Lane. 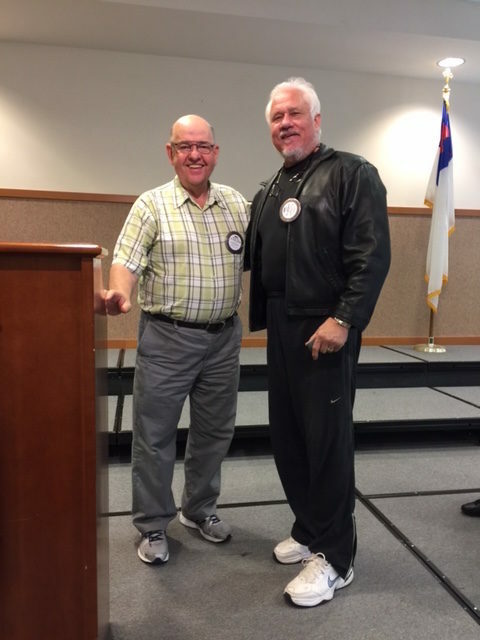 Our club has 16 Paul Harris fellows ….Mike also announced he was on his way to two locations: Hermiston to help plant a peace pole at Blue Mountain Community College, and then to Chicago, where he will be attending the opening of a special opera written by his son. Grant Gerke had incredible news. 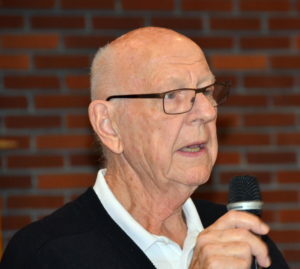 He told us that both our club and the morning club could EACH expect a check for about $100,000 in May from the proceeds of the sale of A-dec’s portable equipment. 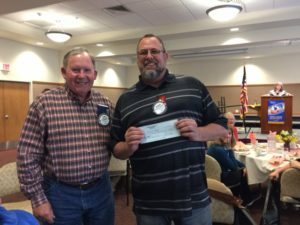 On top of that, $18,000 will be given to the Salzburg, Austria club. How very, very fortunate our club is……. 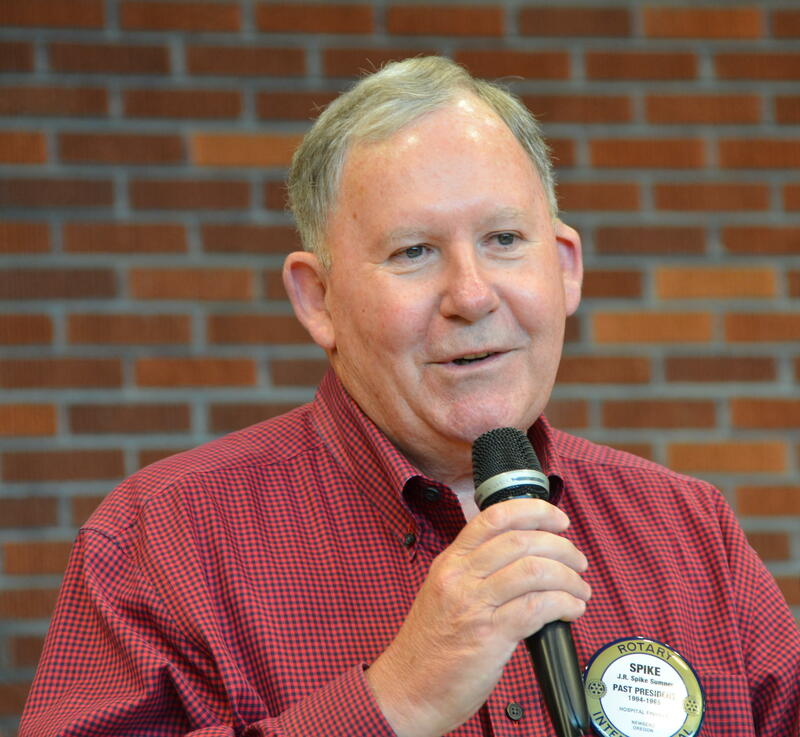 Ralph Koozer reported that the new Habitat for Humanity building has been dedicated, and the Restore should be open by the end of the month. President-elect Todd Engle announced he will miss this week’s meeting due to plans to become a grandpa for the 5th time. He knows this for sure, as his daughter is scheduled for a C-section! And Dan Keuler shared a great story –he and his wife are expecting their first child. They had an ultrasound done, but did not look at the results. They plan to “open the envelope” to find out the gender on Mother’s Day. 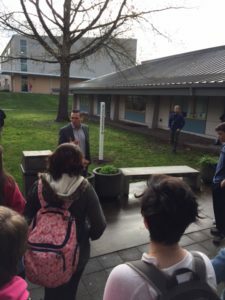 Sharing some photos of the fabulous “Peace Pole Dedication Project” last week. Rotary provided for some 50 poles in Newberg, including one at every public school! Save the date! The 7th annual “Rubies & Roses” benefit ball for Chehalem Youth and Family Services is scheduled for Saturday, June 3 at 5 pm at the Cultural Center. Donations, sponsors and attendees welcome. 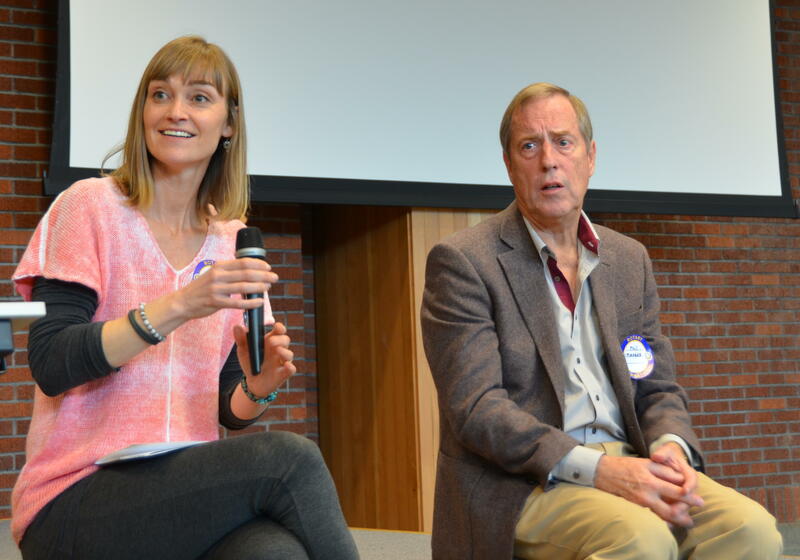 Well, as President Leah said, “It was a really, really busy meeting” last week. 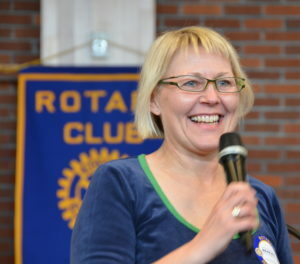 Sally is looking for ways to utilize her skills in the Newberg area. She also has 17 years experience in Human Resources and is willing to work with Rotary, perhaps as a sponsor for some of her classes. She has already jumped in, teaching two “parent nights” at Edwards Elementary School and two sessions at Newberg High School on how to interview for employment. She has also done volunteer work, including teaching interviewing at Coffee Creek correctional facility. Her resume is very impressive and includes 10 years working with a school district to reduce substance abuse by teens. She spent years with at-risk kids, teaching prevention of drug and alcohol abuse. Sally gave us some tips on effective parenting. For example, she said you might make a list of the traits you want your kids to have when they grow up. Then you can work on modeling these traits over the years. She gave the example of the trait of honesty. And unfortunately, how many parents tell their kids to be honest and then turn around and cheat in front of them by, say, lying about their age when purchasing a ticket at Disneyland! Asbjorn Morch (above) entertained us. His mom, Henriette (right), told us about her experiences as a foreign exchange student and with life since. GUESTS LAST WEEK: Walter and Julie Want brought a lot of guests last week! One was their utterly delightful, former foreign-exchange student from Denmark, Henriette Holm Morch, who had stayed with the Wants 30 years ago. She was in Oregon on vacation with her two sons, Harald and Asbjorn. Asbjorn even entertained us by playing the guitar and singing. 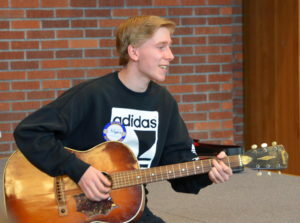 Also a guest of the Wants was musician Matt Simek. So maybe they need a break from all the company? The Wants are now off to Italy and Croatia for a month! 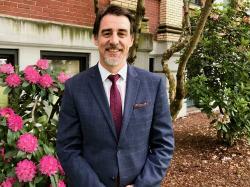 Mike Caruso’s guest was Scot Headley, dean of education at George Fox University and also chair of the Peace Village Newberg steering committee. Auggie Gonzales presented Scot with a check for $5000 to support this year’s camp, which is scheduled for June 26 through 30. Visiting Rotarian Ty Burlingham (from Woodburn) visited us for the second week in a row. Scott Karn gets a congratulatory handshake from Stan Kern. GOOD NEWS/BAD NEWS/GOOD NEWS: Scott Karn had a major announcement for us last week. The good news: He has accepted a new position in Portland with Columbia Credit Union. The bad news: He will be leaving our club, and he was in line for the club presidency. The good news: Om Sukheenai is stepping up and will replace Scott. You will really be missed, Scott. You have done so much for our club. And I know from personal experience you were the best egg runner ever at the annual pancake breakfast! FUN STUFF: Dale Welcome was back from five weeks of travel, during which he had the chance to check on our water project in Nepal. 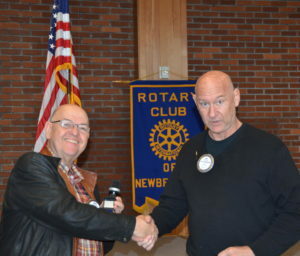 He presented us with a flag from the Kathmandu Rotary Club. Next up–more travel. Dale will be participating in a World Vision Global 6K Walk for Water on May 6 in, of all places, Dakar, Senegal. (To help sponsor him, please go to www.teamworldvision.org/participant/dalewelcome.) So guess where Jim McMaster’s son just happens to be? Dakar, Senegal. Amazing. Laura Tilrico is in California for 12 days to visit family. 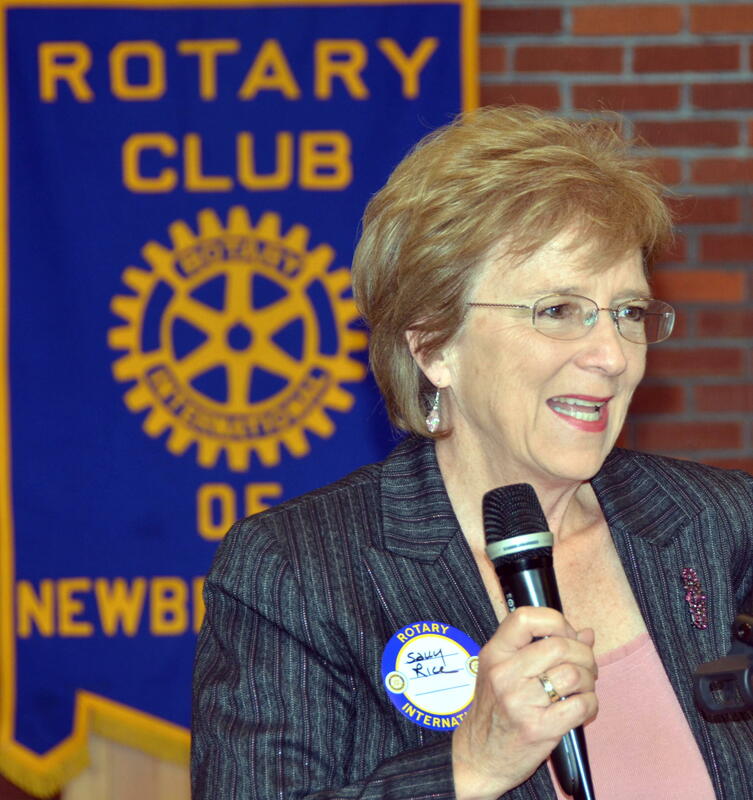 She will have a chance to visit the Tracy Rotary club, where she became that club’s first woman president in 1991. Om announced that a RYLA applicant is still needed. Applicants need to be between 19 and 28 years old. If you know of someone, please contact Om. We had a very special “My Rotary Moment,” prepared by Paula Radich. 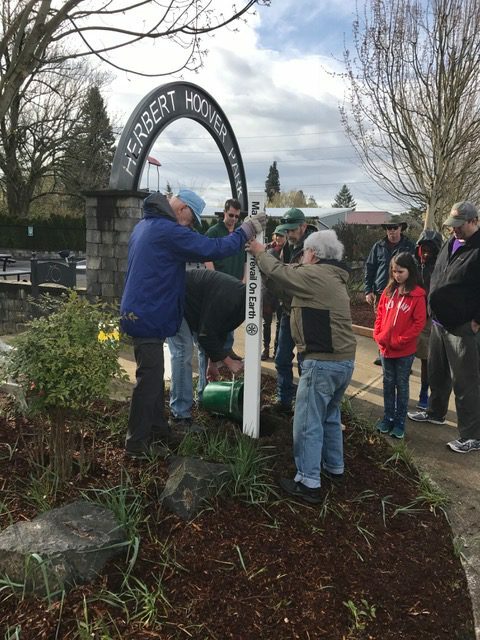 Paula put together a “slide show” featuring the planting of peace poles at CPRD facilities around Newberg on April 8. Special thanks to all who participated. Next week we’ll feature photos from the many dedications of the poles around town on April 14. Over 50 poles have been planted in Newberg, thanks to the leadership of Mike Caruso! 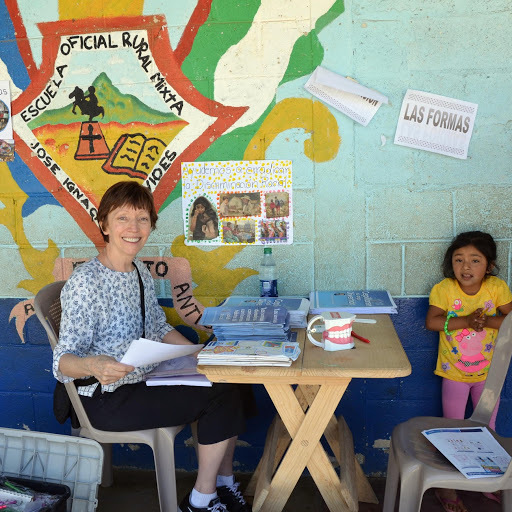 Lynn Montoya Quinn on dental education duty in Guatemala. Auggie Gonzales and Lynn Montoya Quinn were back from Guatemala and reported out on this year’s completed dental mission. (Allen Methven participated this year also.) 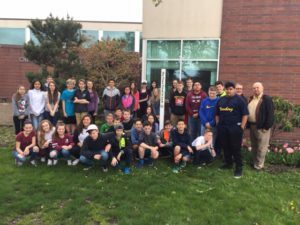 Auggie said there were 17 volunteers this time– eight dentists, two OHSU dental hygienists, two Pacific University students and one physical therapist–his wife! They treated 67 patients the first day, 40 the second, 53 the third, 68 the fourth, and 40 the last, for a total of 268. Wow! For some of the patients, a whole year’s worth of care was provided in one session. And Auggie’s wife treated 21 physical therapy patients. Such a wonderful, important service project. Lynn will be reporting out on the needs assessment in San Mateo soon. This newsletter will be short, as we had an assembly meeting last week with no formal program. 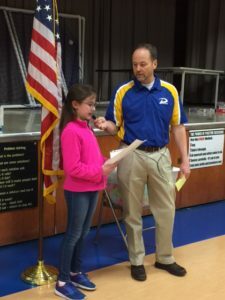 President Leah asked club members to consider the type of community service projects they would like to see the club involved with. She mentioned that we already do the Christmas tree lighting ceremony goody bags for children, the Memorial Park cleanup before Memorial Day festivities, the SMART reading program, the distribution of dictionaries, our scholarships, and help with Special Olympics. If you have any ideas, please contact Leah. 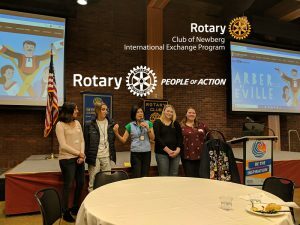 Leah also announced that the Newberg City Council issued a proclamation last week commending the Rotary Peace Pole project. 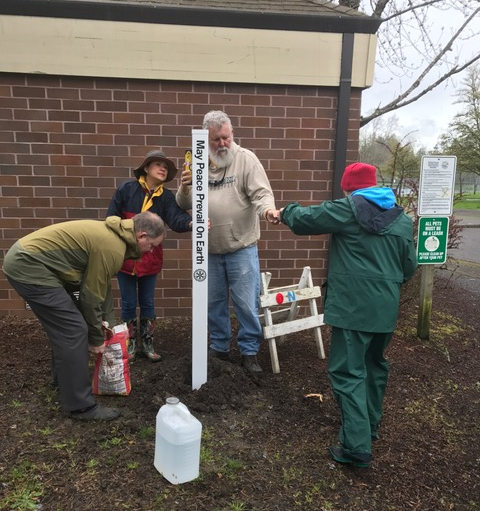 Poles were planted at 11 sites last week, most at CPRD locations, such as Hoover Park. Thanks to all Rotarians who showed up to help. This Friday, the 14th, there will be dedications at a number of locations, including the Newberg schools. 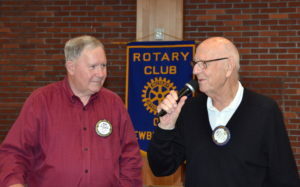 Rotarians are still needed to represent our club and say a few words. If you can help, please call Mike Caruso or Suzanne Miller. I must say that I noticed poles as I was driving near the fire and police stations. What an amazing community statement for our Rotary club to make! Walter Want and others planted a pole at Hoover Park. President elect Todd Engle and others planted a pole last Saturday. PAUL HARRIS AWARDS: Kudos to both John Kerkanich and Grant Gerke, who were both presented with Paul Harris awards by Mike Caruso. Thank you, John and Grant! Jim McMaster mentioned two upcoming volunteer opportunities you might want to consider: Thursday, May 25, before Memorial Day to help clean up Memorial Park before the veterans’ activities, and the new pool playground will need help next Fall. Mike Caruso let us know that the Cyprus Friendship program is still looking for one more host family for the month of July. If you can house 2 kids who want to learn peace building skills here to help their country, please let Mike know. 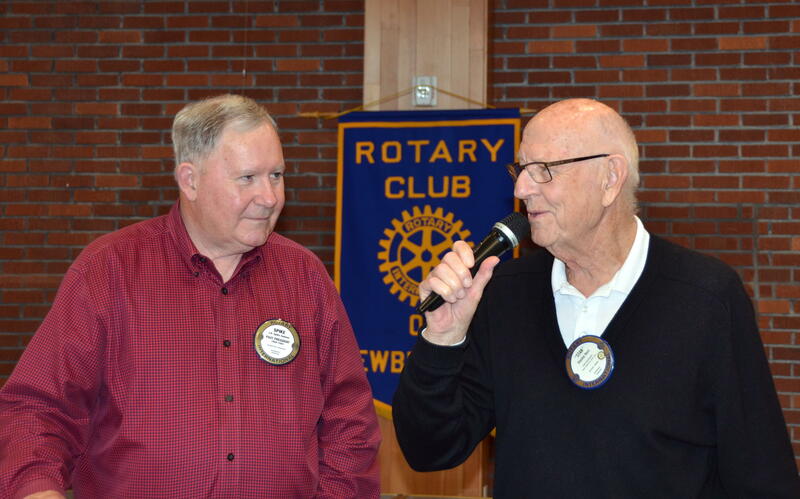 Ralph Koozer reported that Habitat for Humanity has work parties every Saturday and can always use help, too. Mike Pollock, right, beams after Spike Sumner handed him a check. Spike Sumner presented a check from the club Foundation to Mike Pollock for $29,400 to assist Helping Hands in their mission of providing programs and services to help homeless individuals and families. Helping Hands operates 11 facilities in a multi-county region, and has 8 re-entry homes and one homeless relief center. Auggie Gonzales, Lynn Montoya Quinn and Alan Methven are returning from the Guatemala dental mission, and we should hear more about their trip next week. Don’t forget the District Training Assembly at Reynolds High School in Troutdale on Saturday, April 22. 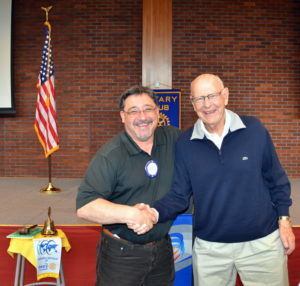 There’s so much to learn about this big, wonderful Rotary organization, and you can meet and make lots of new friends. Our Rotary dental clinic team is off to Guatemala! 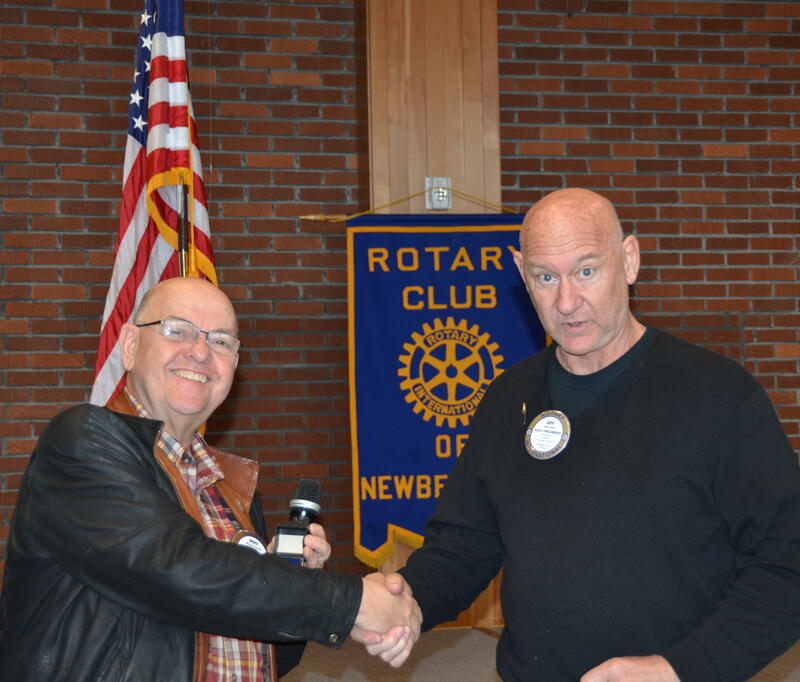 At last week’s meeting, Dave Parker updated us on our club’s donation of Lego Robot Kits to 4th and 5th graders at Joan Austin Elementary School to help them meet the Next Generation Science Standards. He showed a fun video of the “Can Dew” challenge, where the kids performed the engineering feat of programming a robot to push 5 cans out of a circle drawn on the floor and then parking the robot in a “garage.” What a kick. Next thing you know these kids will figure out how to have our Rumbas returning cans for the bottle deposit! Dave also asked for help in evaluating scholarship applications. If you can spare a little time, your help would be appreciated. Volunteers are needed April 21 through May 5 to read applications. Interviews will take place May 16. Lynn Montoya Quinn brought Rose Doherty, the coordinator of the Learning Garden at Portland Community College Newberg. Rose is looking for volunteers to help build the Cob Shed we learned about at a meeting awhile back, as well as to help construct raised beds. This will be a garden for our community, so check it out! Becky Ankeny’s guest was her husband, Mark, who was on Spring Break from Pacific University, where he is Vice President of Enrollment Management and Student Affairs. Deborah Cathers-Seymour introduced her guest, Dr. Doug Altilio, a psychologist now with Chehalem Counseling Center. Doug said he will be supervising clinicians and interns, and lives in Beaverton. 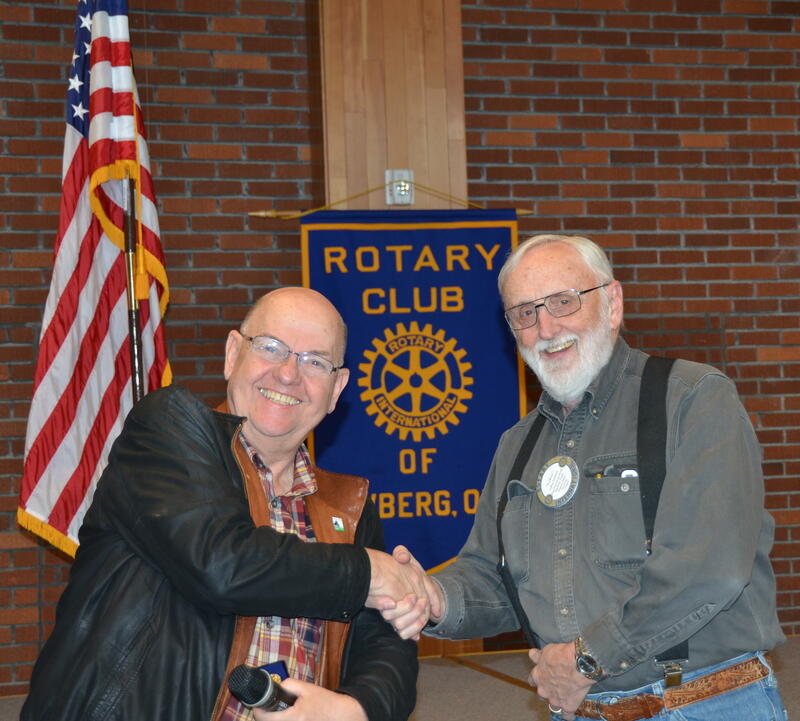 He is excited to learn more about the Newberg community. We also welcomed back Mike Caruso ,who had just returned from 5 days in Israel and 7 in Palestine. Mike was there working to develop a peace project with various Rotary clubs, in conjunction with George Fox University, which has a sister school in Ramallah. And he doesn’t get a chance to rest, as the planting of the peace poles starts this Saturday, the 8th. Ana and Phil discuss “Give A Little” projects. 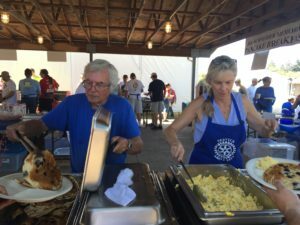 Ana Barsotti and Phil Pirages of the McMinnville-based nonprofit “Give A Little” presented their vision of helping needy folks in Yamhill County. Founded in 2008, “Give A Little” gives one-time, small grants to people in trouble, but who are just a short distance from self sufficiency. Here’s an example: the fellow who has a job, but just can’t afford his car repairs. And he needs the car for work. 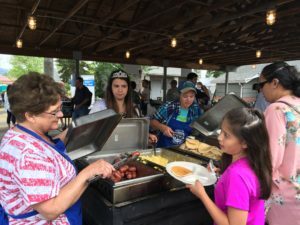 In 2008, they served 20 families. Now, they help more than one person per day. “We’re really trying to improve the quality of life for poor people,” said Phil. 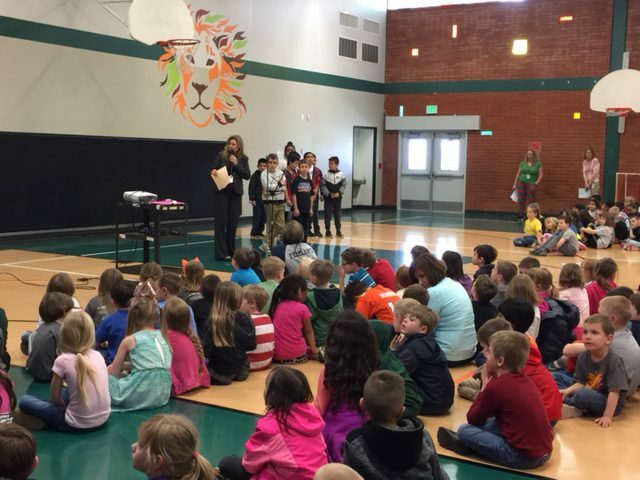 They especially help seniors, veterans and at-risk school kids. They mostly work behind the scenes, getting leads and projects from 25 front-line agencies like YCAP, St. Vincent DePaul, Love, Inc., and Chehalem Counseling. Ana is their first employee, and she is part-time. They have done many diverse types of projects, such as working with McMinnville High School to help homeless kids by providing hygiene kits, or working with the Knights of Columbus to provide jackets to the needy.